Hunger strikers in front of PMs house unwilling to make do with PMs promise: 'Demand decision with budgetary clause'. 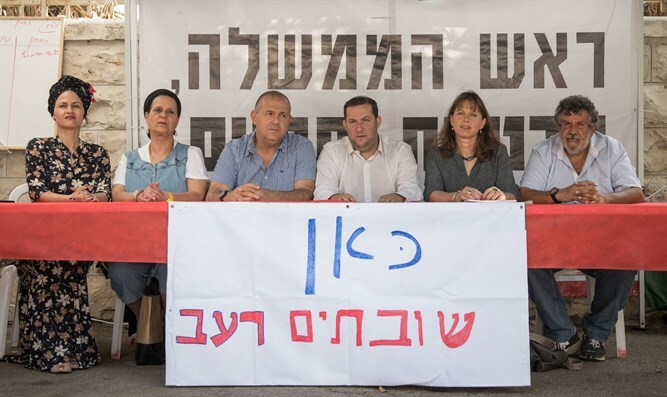 In the protest tent of the mayors of Judea and Samaria and bereaved families, they are not moved by the announcement made by the Prime Minister in the Likud faction today which included a promise to budget bypass roads and security components. Bypass roads avoid populated Arab areas. Yossi Dagan, head of the Shomron Regional Council, said, "We arrived at the faction meeting after more than two weeks spent in front of the Prime Minister's residence and after two days of a hunger strike. We welcome the Prime Minister's announcement that there is willingness to pass the budget for bypass roads and defense components on the roads, and it's a shame that we had to go on a hunger strike in order to achieve a statement about the obvious - the security of half a million citizens in Judea and Samaria." However, he is not content with promises. "We expect no promises because we were already made promises on this issue, and we expect a real decision backed by the budgetary clause and until it arrives, we will continue the hunger strike on the sidewalk opposite the Prime Minister's residence. We ask the Prime Minister to make the decision and bring real security to the residents of Judea and Samaria." Avi Naim, head of the Beit Aryeh council, said that "two weeks on the sidewalk and two days of hunger strike so far are nothing compared to the pain of the bereaved families in the 10 years we've been waiting for the completion of the Luban-Rantis bypass road." "Our families' security is fundamental, and we expect it to be the top priority of the State of Israel and the Prime Minister, and we expect it to be realized immediately because we've had it with promises. Until then we will remain on the sidewalk and continue the hunger strike."